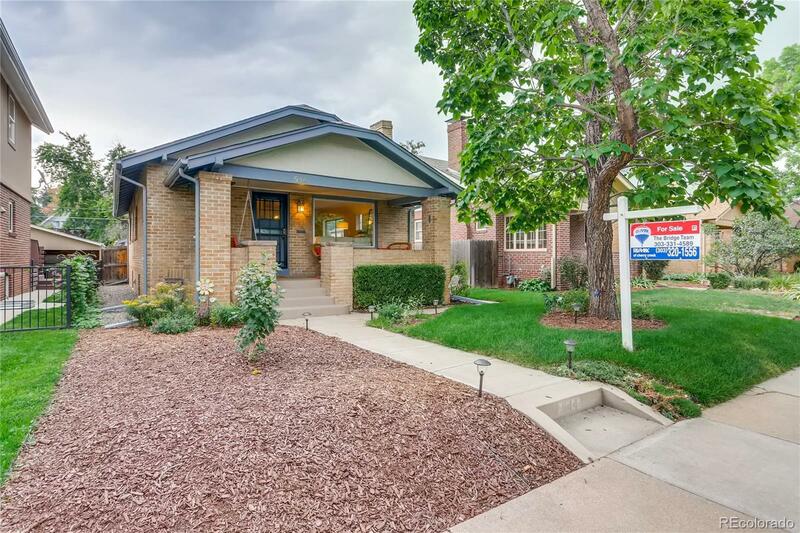 Charming bungalow in West Wash Park maintains original architectural details with thoughtful updates throughout. Features include gleaming hardwoods, crown molding, period built-ins, a cozy gas fireplace, and ample windows. The kitchen boasts granite counters, stainless appliances, and maple cabinetry with a built-in desk. There are two bedrooms and a full bath on the main floor. Downstairs has been finished to provide an alternate master suite or comfortable guest quarters with two egress windows, family room, bedroom (non-conforming), an updated full bath with double vanity, and walk-in closet with custom ELFA shelving. A tidy laundry room and separate storage round out this level. Pleasant outdoor entertaining space includes a backyard deck and yard with new sod plus an idyllic front porch complete with a porch swing. A two car garage sits on the alley. Great location just 4 blocks to the park, and within close proximity to neighborhood favorite shops, restaurants, and schools.